Sparky Sprint registration includes: T-shirt, race bib, finisher medal, pancake breakfast. 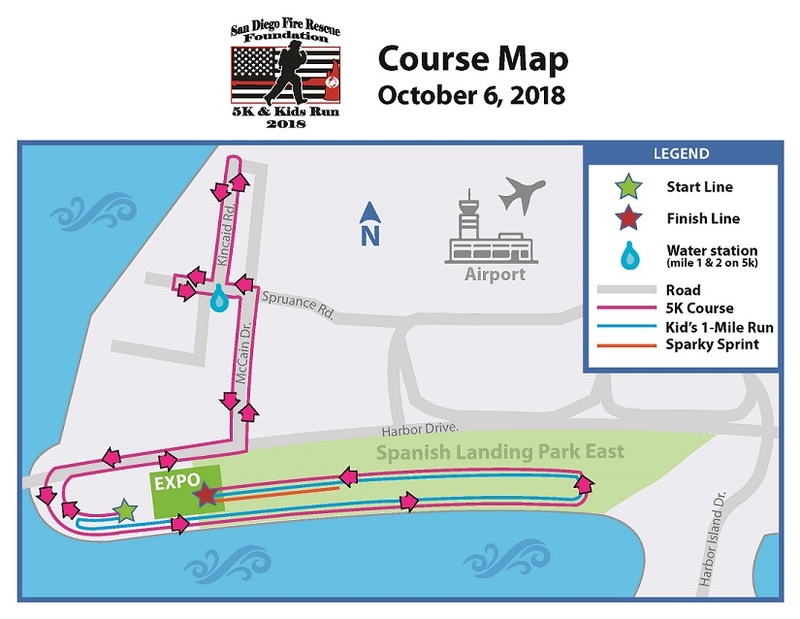 The fun and unique 5K course starts at Spanish Landing Park West and runs through the San Diego Fire-Rescue Department’s training facility before looping back toward Spanish Landing Park East then the finish line. Water stations will be available on the outbound and return. Prizes for the Overall Winners: First male and first female across the finish line. Medals for Age Group Winners: Top 3 male and female in each category. This is for the 5K only. Medals for Stroller Participants: Medals will be awarded for the first male and first female across the finish line who are pushing a stroller. This is for the 5K only. Medals for Public Safety Personnel: Medals for the first male and female public safety personnel across the finish line. This is for the 5K only. Public safety personnel must present a valid fire/lifeguard/medic, law enforcement, or military ID at registration packet pickup (No Exceptions!!!) Valid for active or retired first responders only. Family members and friends running with first responders MUST register as general admission runner/walker NOT as Public Safety Personnel. Please note that family members and friends can run/walk together; however, only the Public Safety employee with valid ID can use the Public Safety discount code. We’ve partnered with In Motion Fit to bring you the San Diego Fire Rescue 5K Training Plan to help you prepare and train for the race. This is a great plan for anyone but will be especially helpful for folks interested in walking or running their first 5K. We know you can do it and we’ll cheering you on along the way. The Kids 1-Mile Run starts at 9:00am and is open to all children ages 6-12. Parents are encouraged to cheer on their runner from the sidelines but ARE NOT allowed on the course. The safety of everyone is our top priority. We will have uniformed course guides running with the kids and stationed along the course. Please be considerate of other participants and spectators. Sparky Sprint (100 yards) will take place at 9:30AM and is open to all children ages 3-5. All children will receive a kids race shirt, finisher medal and complimentary pancake breakfast. Entry fee and registration are required. Parents are encouraged to cheer on their runner from the sidelines, but they are allowed to run with younger participants who may need a little extra encouragement. The safety of everyone is our top priority. Please be considerate of other participants and spectators.